I’ve been trying to learn a bit more about PPACA (aka, Obamacare) and its effects. It hasn’t been something that has interested me a great deal until the last week or so, so I am approaching this from a position of ignorance. But I have been reading through as much material as I can find. In terms of actual numbers of people – according table table 1.1.a of the aforementioned report – we went from 43.8 million uninsured people to 28.6 million uninsured people in 2016. This was a huge increase in the number of people with health insurance, and a tremendous benefit for a lot of people. Comparing the average premiums found in 2013 MLR data and 2017 CMS MIDAS data shows average exchange premiums were 105% higher in the 39 states using Healthcare.gov in 2017 than average individual market premiums in 2013. Average monthly premiums increased from $232 in 2013 to $476 in 2017, and 62% of those states had 2017 exchange premiums at least double the 2013 average. As a backdrop to all of this, two additional things are worth noting. The US was already an outlier when it came to healthcare spending as a share of GDP even before the Obamacare provisions kicked in. That despite the fact that many countries that spend a lot less than we do already had something like universal coverage by then. Now is the time to finally keep the promise of affordable, accessible health care for every single American. If you have health care, my plan will lower your premiums. 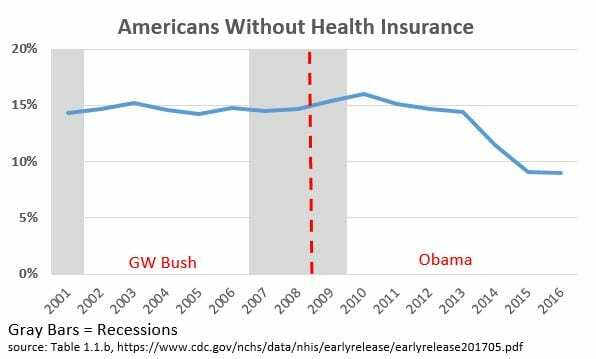 Of course, this didn’t quite happen… more Americans have access to health care, though there are still over 28 million uninsured. And of course, for quite a few (just about all?) of us, this promise of lowered premiums hasn’t happened. Quite the opposite, in fact. So what is the end state? Why does the system we have fail so many people? How can we make it better? Update… The graph at the bottom of this article from the Washington Post is quite informative. A story that is getting some traction, though mostly lost against the New York primary, is that for profit health insurance company United Health Care is looking to drop its Exchange Plans under PPACA. For example this from Fox: UnitedHealth pulls back on ObamaCare exchanges amid huge losses This is of course presented as some additional proof of the failure of ObamaCare. And given the current structure that has the Exchange 100% reliant on private insurance providers and so vulnerable to insurance provider drop-outs this may be. But from the perspective of supporters of the original version of PPACA, the one that came out of Senate HELP and the House Tri-Committee this was more a feature than a bug. In 2009 it was abundantly clear that Single Payer/Medicare for All was not a viable option. It wasn’t going to happen. (Please argue the point in comments.) But there was a narrow window open for a backdoor path to Single Payer. And that was the Public Option in both its Strong and Weak forms. The idea was a properly designed Public Option would out-compete any private insurance provider on price. That is with or without some form of the mandated limits on the Medical Loss Ratios that in turn restricted Big Insurance profits, private insurers would find some markets unprofitable and so abandon them. In particular this was projected to happen in rural markets and second and third tier metro areas. Which markets would then be available for scoop up by the (so-called) non-crofts and the Public Option. My own vision was that over time a version of Single Payer would evolve from the outside in as Big Insurance retreated to serving high margin/richer urban markets. Now of course we don’t have the Public Option. But even so I am not going to shed a tear that for profit insurers like United Health just are not having the success in extracting huge rents from PPACA. Because those rents/profits were not adding value anyway. And while there is theoretically some downside in reduced competition the structure of PPACA doesn’t really allow surviving health care insurers to extract monopoly rents. And to the extent that certain markets begin to be underserved there will be that much pressure to allow entrance to some version of the original Public Option, perhaps by leveraging the presence of existing Public Health, Veterans Administration and even Indian Health Service hospitals and clinics. And Community Health Centers. And Free Clinics. Any of which would benefit by a new pool of actual paying customers with insurance funded by Exchange subsidies. Now clearly there are some dangers to trying to transition to Single Payer via crowding out for profit insurers. Especially since there is not an existing Public Option in the way the original plans envisioned. Still there is no reason to cry that Wall Street is not extracting what it considers to be its due pound of flesh by providing health care to rural and poor areas. United Health Care had a business plan. Its success required large rent extraction. That the PPACA as designed didn’t end up making it as easy to extract excess rents as the FirePups assumed is a good thing. The road to Single Payer is certainly rocky. And maybe we will never get there in total. But if we do seeing the corpses of United Health Care and Aetna as squished road kill should not be triggers for pity and sorrow. Unless you are a Free Market fetishist. Apparently there’s a special place in hell for Democratic politicians who criticize Barack Obama as insufficiently progressive. And a special place in heaven for politicians who have accepted $133,246 from the private-prisons industry but tell Black and Hispanic voters at a debate shortly before the Nevada caucuses and South Carolina primary that they want to end the private-prison system. Clinton is accusing Sanders of being anti-Obama. Feels fake and contrived to me, and rather nasty. — Is it just me, or is the Clinton campaign’s take on how to appeal to African-American voters really demeaning, Me, Feb. 3, quoting myself in a Jan. 24 post. But, hey. All three of us are white. And Black folk might not get what she’s doing. And any who think they do would be wrong. Like all of us women who mistakenly thought Clinton had, throughout her campaign, bludgeon-like, been asking women to vote for her because she’s a woman. All those incessant Pavlovian references to women? And last week, her declaration that Sanders must be the only person who thought she was a member of the political and economic establishment, because she’s running to be the first woman president and by dint of that fact clearly has no connection whatsoever to the politically and economically very, very powerful? Or even to the slightly powerful? She disabused us last night of the misconception that she was asking women to vote for her because she’s a woman. Instead she was asking us to vote for her because she has no connection to the politically and economically powerful. Good grace. Where to begin. Having no healthcare insurance is not the same as having healthcare insurance. Unless of course the medical care you need is not covered by the insurance you have, because the deductibles and co-pays under your employer-provided insurance or under the policy you bought through a state marketplace under Obamacare for a premium low enough that your employer or you could afford it, means (unlike more comprehensive plans that others have but you do not) that you must pay those medical bills yourself. But then, neither, it appears, does her mother, who has claimed repeatedly, including in comments in defense of her daughter’s odd statements about Sanders’ single-payer concept, that the only expenses—the only money people pay—that actually matters to them is money paid to the government. No other expenses count as money—as loss of income or as other expenditure that actually effects your and your family’s financial bottom line and therefore standard of living. Money paid to UnitedHealthcare or Anthem Blue Cross in premiums, and to hospitals, physicians and medical labs in co-pays and deductibles, don’t count. That’s not money paid to the government, see. So it’s wayyy better to pay more for less-comprehensive coverage to private insurance companies, and still be financially insecure about medical expenses, than to pay less money in healthcare costs to the government and be financially secure about medical expenses. Because, y’know … the government. Which—I wish Sanders would point out—is exactly what Clinton says. Again and again. Just like the Republicans do. Hillary Clinton should get out more, too. Sanders did almost exactly that in the debate last night. But I hope, especially in light of Krugman’s column today, that he points out that the Democratic politicians and commentators who say the public thinks that the only money that matters to their financial bottom line, the only expenses that effect their standard of living, is taxes. Or that the math involved to understand that that is not so is too complicated for most folks to perform. Calculators are cheap these days. Even the hoi polloi can afford one. Sanders got it right last night. This is the Republican mantra. And it’s no longer selling so well. But Sanders also should question why it is that the Clintons and now Krugman, and surely other wealthy Democrats, think (or claim to think) that large and annually increasing healthcare premiums and co-pays and deductibles don’t matter to middle class and so-called working class folk because they’re paid to private insurance companies and private hospitals, physicians and medical labs. Sanders’ next ad should feature one of those folk saying that his or her family’s healthcare insurance premiums and the four-figure medical bills they are paying for a short hospital stay are actual money. Honestly and truly. Another ad should show a small-business owner discussing the amount the business pays in premiums for private insurance for its employees and that paying less to the government in additional taxes than the amount it is paying for private insurance could be paid instead in increased salaries and wages. And there should be a third ad, maybe featuring that very same small-business owner, explaining that the business has a few employees who are seniors and receive, um, Medicare—and that the business pays for their excellent Medicare supplement insurance. Not complicated. And not very costly, given that Medicare is—yes, really—itself good insurance. So … voila! Hard feelings by those employees because they aren’t part of the awesome UnitedHealthcare plan that the younger-than-65 employees have and love. The Clinton claims and Krugman arguments are profoundly elitist. They’re spades that should be called, by Sanders, what they are: spades. Krugman, too, should get out more. *Chelsea Clinton said last week that she doesn’t “want to live in a country that has an unequal health care system again.” As I said in my post yesterday, she apparently wants to move to France. Or Canada. Or Scandinavia, or Germany, or Thailand. Or one of the many other Western-style democracies that has an equal health care system. Krugman’s assessment leaves out one extremely important reality and understates a second. rights in a democracy and it is a very big mistake. Krugman also understates the problems that Obamacare is causing out here in “reality.” Expanding Medicaid has helped the poorest of us get some care, but that program’s low reimbursement rates mean that many doctors decline to treat Medicaid patients. The doctors who do take Medicaid are swamped by the newly Medicaid eligible, and may lose money treating them. For many people who buy insurance policies through the exchange, massive deductibles must be paid before the insurer pays anything. Doctors across the country have noted the increase in the number of “insured” patients who are having serious problems figuring out how to both eat and pay their deductibles. Krugman wrongly says that “access to health insurance for all Americans” has been the goal. It’s access to health care—not to insurance—that matters. Obamacare too often fails to achieve it. UPDATE: To see the winning Clinton claim, read my my comment to Robert Waldmann’s post above. Last week when Chelsea Clinton made he now-infamous statements about Sanders’ single-payer healthcare insurance plan—specifically, the one he proposed as a bill in 2013, but presumably a blueprint for the one he plans to propose—I wondered how Sanders had managed to enlist her in the service of his own campaign. Most memorable was the part about the horror that would be life without private healthcare insurance and the stripping of healthcare insurance frommillions and millions and millions of people by providing universal, comprehensive, and nearly identical insurance to all American citizens and legal residents. Sen. Sanders wants to dismantle Obamacare, dismantle the [Children’s Health Insurance Program], dismantle Medicare, and dismantle private insurance. I worry if we give Republicans Democratic permission to do that, we’ll go back to an era — before we had the Affordable Care Act — that would strip millions and millions and millions of people off their health insurance. Sen. Sanders wants to devolve the authority to set up state health insurance programs to individual state governors. Now maybe if I lived in a place like New Hampshire, with your governor, I would feel okay about that. But if I lived in a state that had a Republican governor, particularly a Republican governor who already turned down Medicaid expansion matching funds, I don’t think I would be comfortable, right? Because I don’t want to live in a country that has an unequal health care system again. Sooo, I said when I read that, Chelsea Clinton wants to move to France. Or Canada. Or Scandinavia, or Germany, or Thailand. Or one of the many other Western-style democracies that has an equal health care system. Which is what she will have to do under this country’s current system if she feels that strongly about not wanting to live in a country that has an unequal health care system. Sanders’ 2013 proposal no more gives the states the option to join or decline to join the program than does Obamacare—the program Chelsea and her mother champion and want to preserve rather than move to a single-payer-healthcare-for-all system—give states the option of participating in the state-based marketplaces that have minimum coverage requirements and mandate acceptance of patients irrespective of preexisting medical conditions. The Medicaid-expansion option that states have under the ACA has no analogy in Sanders’ 2013 single-payer proposal. Chelsea was parroting her mother on this bald misstatement. And having no healthcare insurance is not the same as having healthcare insurance. Unless of course the medical care you need is not covered by the insurance you have, because the deductibles and co-pays under your employer-provided insurance or under the policy you bought through a state marketplace under Obamacare for a premium low enough that your employer or you could afford it, means (unlike more comprehensive plans that others have but you do not) that you must pay those medical bills yourself. Apparently, Chelsea Clinton doesn’t get out much these days. Okay, Clinton of course doesn’t want you to realize that that’s what she’s saying. She wants you to think she’s saying that the large price tag for Sanders’ plan is in addition to private insurance premiums and deductables and co-pays. But her own daughter says that Sanders wants to end private insurance. Clinton should check with her daughter. Best to get the story straight. So, buckle your seatbelts, folks. What will the biggest sleight of hand, the most outlandish assertion or inference about Sanders’ policy proposals, be? We’ve already had the Denmark-isn’t-a-capitalist-country-and-it-would-be-a-grave-mistake-and-unAmerican-to-emulate-them thing in the first debate, which sort of backfired when in the days following that debate the news media was filled with articles about Denmark’s vibrant capitalist economy, large number of small businesses, and high level of innovation. We’ve had the no-industry-except-the-gun-industry-has-immunity-from-strict-liability-for-criminal-use-by-a-customer misrepresentation about the gun-manufacturer and gun-retailer legal immunity statute that Sanders voted for in 2005. Actually, no other industry is strictly liable, in any state under state law, under such circumstances, a fact that got little media attention but enough, apparently, to cause Clinton to stop making the claim. And there was, of course, the he-told-ME-to-stop-shouting-even-though-I-wasn’t-shouting-because-I’m-a-woman dust-up. She didn’t accuse him of supporting legislation that would arrest women for disturbing the peace when they speak, but she came close to it. In addition, of course, to the Sanders-is-coming-for-your-healthcare-insurance-and-is-out-to-lower-your-standard-of-living stuff. Denmark! Somalia-level healthcare coverage! Bankrupting the country because the $10 trillion (or whatever) currently spent annually on healthcare in this country WILL EVAPORATE upon enactment of Sanders’ single-payer plan, and so won’t be available to pay instead for the single-payer plan. How about Denmark-level healthcare coverage? For less than what is spent annually in this country for our current Swiss-cheese sandwich. Which is what Sanders is proposing. My bet is that one of tonight’s treasures will again be on the gun-industry immunity law, along the lines of a message to the media last week by Clinton Campaign chief John Podesta. Podesta conflated manufacturing with sales. Specifically, the level of control that the fast-food industry has over the content of the food it serves, and the level of control that gun retailers have over their customers’ later use of the purchased gun. But there’s still time for you to enter this contest. Okay, not much time; I should have posted this earlier. But for all you very quick thinkers, that should not be problem. The prize is an interview with the Clinton Campaign for a job as a campaign consultant. The job will pay well, I’m sure. Democrats should take continued GOP opposition to Obamacare very seriously. It has serious real-world consequences. As long as states hold out against the Medicaid expansion, it could slow the law’s efforts to realize its goal of expanding coverage. One thing this means is that Democrats should redouble their efforts to regain electoral ground on the level of the states, where future decisions about the Medicaid expansion will be made. I should have known by now that neither Democratic politicians, nor their political consultants, nor virtually any progressive pundits will ever consider the possibility that it puts the cart before the horse to try to regain electoral ground on the level of the states through some generic campaign that doesn’t the issue of the Medicaid expansion—so that, once in office, the Dems can enact the Medicaid expansion. But, no, I had thought that the one plus in the months-long concern about the outcome of King v. Burwell—which indicated the political disaster that a win for their side would cause the Republicans (they were seriously panicking)—was that the Dems and progressive pundits would recognize, finally, that providing access to healthcare for those who otherwise have no access to it is popular. Especially, it turns out, among the beneficiaries and potential beneficiaries. And that campaigning on the issue increases the chance of winning. But I should have recognized that once pols, consultants, and pundits get locked into a mindset about something, nothing will jar them loose from it. Nothing. Ever. In its ACA opinion today, the Court significantly narrowed its “Chevron-deference” doctrine. I’m glad. Even despite the immediate repercussions for EPA authority. [T]oday’s victory may have been even more decisive than it looks at first glance. It isn’t just that the Court ruled six-to-three in favor of the government’s position, with John Roberts and Anthony Kennedy joining the Court’s liberals in support of a single, non-splintered decision, though that’s important. It’s also that Roberts’ opinion may have precluded any future efforts by a Republican president to use executive discretion to cancel the subsidies for the millions of people on the federal exchange. [Italics in original.] This option might have been left open if the ruling had been written differently. The Court issued opinions in two of its seven remaining cases this morning, in this one, King v. Burwell, is in my opinion the lesser-significant of the two. Texas Department of Housing and Community Affairs v. Inclusive Communities Project, in which the Court, ruling 5-4, upheld as both intended by the Fair Housing Act and within permissible constitutional bounds the right to invoke that Act to challenge government agency and private business actions that, while not overtly racially discriminatory, plainly have a discriminatory effect. It is a tremendously important opinion, even beyond the housing issue. And no slouch in the significance department is another 5-4 opinion issued this week, Kingsley v. Hendrickson, that began, finally, the process of limiting what has been the tacitly unfettered authority of prison guards to brutalize both pretrial detainees and post-conviction inmates—although the dissents in that opinion deserve their own post, and soon will get one. But the far-reaching importance of the King opinion today, authored by Roberts, is in its choice to interpret the statute directly as providing for the subsidies irrespective of whether a state had designed and runs its own insurance exchange or instead defaults to the option by which the federal government created and runs the state’s exchange. The government had argued both that that was the clear intent of the statute in providing for the default (the backup) option, and, alternatively, that under a Court-created doctrine known as “Chevron deference,” courts are required to give deference to the statutorily designated federal agency—here, HHS—in the agency’s reasonable interpretation of an ambiguous provision in the statute. The Chevron-deference option would have enabled a later White House administration’s HHS to interpret the statutory language at issue—“an Exchange established by the State”—as the King plaintiffs claimed: Tax credits are available only in states in which the Exchange was set up and is run by the state, not an Exchange set up and run for the state by the federal government. The Chevron-deference doctrine was created in a 1984 Supreme Court opinion, Chevron U.S.A., Inc. v. Natural Resources Defense Council, Inc., mainly for the purpose of allowing Reagan’s regulatory agency chiefs to orchestrate the industry capture of the respective regulatory agency charged with regulating the capturing industry. Federal laws that create regulatory agencies provide that the agency itself will design regulations addressing specifics, in order to give effect to the broad design and mandates of the Act that establishes the agency. The EPA was the original target of the Chevron doctrine, and is still the most common, I believe, but obviously the doctrine comes in handy in undermining regulations regulating the financial industry, the pharmaceutical industry, employee safety, and, well … you get the idea. The doctrine’s stated premise is a clearly sensible one: that the very purpose of creating a regulatory agency is to have a permanent body of experts in the relevant fields employ their expertise to study the science, the technology, the methodology, and promulgate regulatory mandates and parameters that give effect to Congress’s purpose in enacting the statute and creating the regulatory agency. But the extreme deference that the Chevron doctrine has appeared to accord to the agencies has, rather than served to effectuate congressional regulatory purposes in enacting the statutes that come within the regulatory jurisdiction of the relevant agency—the Clean Air Act vis-à-vis the EPA, for example—turned control of these agencies into political footballs. Which was fine with the conservative justices, as long as the White House was in Republican hands. But nearly seven years into the Obama administration, they’ve had enough, and have begun to make noises indicating a change of heart on Chevron. They want to rein it in. Two of them, joined by the four Democratic justices, took the first step toward that today, in King. And tomorrow, it is widely expected, in a case called Michigan v. Environmental Protection Agency, the five Republican justices will take a second, broader, and direct step, in an opinion that will strike down as beyond its authority under the Clean Air Act the current EPA’s interpretation of that statute as permitting it to regulate the release of mercury into the air by power plants. And as a longstanding critic of the Chevron-deference doctrine, I’m thrilled with the Chevron implications of King. As someone who’s not fond of the effects of mercury on the health of anyone or anything who breathes, though, I won’t welcome the substantive result in tomorrow’s opinion. But I hope, and think, that the issue of statutory regulation of power plants will become a somewhat potent issue in next year’s national elections. What won’t be a national issue in next year’s elections, federal and state, are tax credits for subsidies for healthcare premiums under the ACA. Which is precisely why Roberts and Kennedy decided that King must be decided as it was decided today. Last March, after the argument in the case, I predicted exactly correctly what would happen, and why—and have never looked back, instead rolling my eyes at all the continued handwringing of liberal pundits so worried about the case’s outcome. I pointed out back then that Roberts, for all his desire to fully, thoroughly, complete the circa 1980s Conservative Legal Movement’s takeover of American law, point by point by point, wants first and foremost, always—always—to provide every possible assist to Republican candidates for federal and state elective office. Once it became clear, as it already had by the time King was argued at the Court, that a victory for the plaintiffs would spell electoral disaster for Republicans for federal and state office next year, Roberts’ vote, and the outcome of the case, was clear as well. The chief justice said almost nothing. Okay, so how well did my predictions from three days ago hold up at the argument yesterday* in King v. Burwell? Well, I got the outcome right, but not the particulars of how it will occur. By saying almost nothing, Roberts said everything you need to know: The ACA will remain undisturbed. He will join with the four Dem justices in an opinion that simply invokes standard statutory-interpretation methods that the Court employs when, say, it’s the Tea Party whose interests that long-established mechanism serves. In, y’know, garbage statutes. There’s no way—seriously; there really is no way—that Roberts would sit through 80 minutes of argument, in this of all cases, almost completely silently, if he intended to vote to interpret the four-word phrase at issue as the statute’s challengers ask. Roberts will leave Kennedy to his federalism obsession—his bizarre the-Civil-War-and-the-Reconstruction-amendments-are-figments-of-the-political-left’s-imagination claims. (Roberts shares this view, but only as a means to specific Conservative Legal Movement ends, such as nullifying the Voting Rights Acts.) Sure, the majority opinion will invoke the fancy the-federal-government-can’t-coerce-the-states-not-even-by-subterfuge federalism ground tailored specially for Kennedy. But it will do so only to undermine the challengers’ belated switch argument: that Congress intended that the subsidies be available only in states that had set up and run their own websites, and that the purpose of the provision in the ACA that provided that the federal government would set up and run websites for individual state healthcare markets in states that do not set up and run their own was to mislead the states about the effect of a failure by the state to set up and operate its own website. (Congress knows better than to try that kind of thing and think it could get away with it! Unless, of course, it knew it wouldn’t get away with it.) Originally, the challengers had argued that the four-word phrase at issue was an inadvertent error. Congress’s clever ruse was predictably effective, since, as Kagan, Sotomayor, Ginsburg and Breyer noted, the federally run websites would have no products available and no customers, so the state legislators who bought the head fake weren’t really all that gullible in not catching on. Then again, as Dahlia Lithwick reported, Scalia commented to Solicitor General Donald Verrilli: “How can the federal government establish a state exchange. That is gobbledygook.” Which surely it is, since although each state has its own separate insurance market under the ACA, available only to residents of the respective state, the ones set up and run by the federal government were intended to have no actual insurance policies available, or customers to buy policies even if one or two policies should happen to pop up on one of those non-state exchanges. And Scalia—no fool, he—does now recognize that that could undermine the challenger’s Plan B argument that Congress gamed this all out and decided to lull the states into a false sense that they could default to the federal government the setup and operation of the exchanges, with no ill effects. Pun intended. So Scalia needed a Plan B to save Plan B as something he could assert in his dissent. But Scalia’s pointing this out wasn’t really the main gist of what he was up to yesterday. What he really was up to was having his cake and eating it too. He apparently waited until it was becoming clear that Roberts and Kennedy would do the heavy lifting for him and Thomas and Alito, and then largely reverted to his November 2014 garbage-statutes position—that is, to his pre-January 21, pre-Fair Housing Act case argument comments about how the Court normally interprets complex, multi-section federal statutes that intend to establish a coherent policy. Well, inadvertent garbage, or instead advertent garbage; whatever. Either scenario works in this silly save-us-from-ourselves-please-while-we-protest-too-much kabuki act. Just as Sens. Orrin Hatch, Lamar Alexander, and John Barrasso indicated in a Washington Post op-ed published last Sunday that was unabashedly directed to Roberts, Kennedy and Scalia. At oral arguments before the Supreme Court yesterday, two of the conservative justices — Samuel Alito and Antonin Scalia — both floated versions of the idea that, if the Court does strike down Obamacare subsidies in three dozen states, it might not be that big a deal, because surely lawmakers would then fix the problem and avert disruptions for millions. This had more significance than it first appeared. That would mean people would not abruptly lose their subsidies; the suggestion was that if the Court did this, the disruptions might not be immediate, and perhaps somehow contingency plans could come together to soften the blow for those millions of people. Verrilli suggested the Court might have this authority, but disputed whether doing this would actually make much of a difference in practice, because many of the states would be unable to set up exchanges — keeping the subsidies flowing — by the end of the year. JUSTICE SCALIA: What about Congress? You really think Congress is just going to sit there while all of these disastrous consequences ensue. I mean, how often have we come out with a decision such as the — you know, the bankruptcy court decision? Congress adjusts, enacts a statute that takes care of the problem. It happens all the time. Why is that not going to happen here? That was indeed a richly comic moment! But it was also very significant. The conservative Justices implicitly suggested that the consequences of ruling with the challengers — which Scalia himself termed “disastrous,” though there may have been a hint of sarcasm there — are in fact weighing on the Court, and they themselves floated the idea that a legislative fix might mitigate those consequences. I don’t pretend to know for certain what motivated the conservative justices to say this stuff. But here’s a guess: The idea that a legislative solution might soften the disruptions could make it easier for Anthony Kennedy (who appeared torn over federalism concerns, particularly in light of the punishment that might be inflicted on states) and/or John Roberts (who seemed at least open to the idea that Chevron deference should be accorded to the government) to rule with the challengers. Okay, well, unlike Sargent, I do pretend to know for certain what motivated the conservative justices to say this stuff. Or at least what motivated Scalia. He just enjoys cake. It’s his favorite dessert. Despite all those calories. Especially when he has the cake and eats it too. Kennedy will join the majority’s ruling only in its bottom line: the ACA survives in its current interpretation. He’ll write a concurring opinion explaining that this is a necessary outcome, in order to avoid so offending the sovereign dignity of 36 states that, in self-defense, they would enter into a military treaty with Russia and attack Washington using an allied force comprised of the Armed Forces of the Russian Federation and the states’ national guard units. Which itself would violate the Constitution’s design because it obviously would have the effect of coercing the states into increasing their own military budgets significantly. But Kennedy’s concurrence will be a sideshow. *Typo-corrected to reflect the day that the post was posted (Thursday), rather than the day when I began writing it, which was Wednesday, the day of the argument. The post also has been edited slightly (and typo-corrected elsewhere) for clarity. I have known for the last five weeks—since January 27, to be exact—that the Supreme Court will uphold the Administration’s interpretation of the federal-subsidies provisions in the ACA when it issues its decision in the infamous King v. Burwell case whose argument date at the Court is Wednesday. I also have known since then that the opinion will be unanimous, or nearly so, and that Antonin Scalia is likely to write it but if not will join it. I considered revealing this to AB readers earlier, but feared an F.B.I. inquiry into suspicions that I hacked into the computer system in Scalia’s chambers, so I hesitated. But it’s now or never—Scalia will make his position clear at the argument, and then I will have lost my one chance, ever, for a career as a Vegas oddsmaker—and I think I can persuade the F.B.I. that I received my information not illegally but instead from a report recounting extensive, pointed comments Scalia made in open court on January 21, in a case that is not about the ACA but is, like King, about the methods the Court uses to interpret lengthy, highly complex federal statutes with multiple interconnecting sections and subsections whose purpose is to establish a cohesive policy.